Level 3 Practicum training is a three day training. 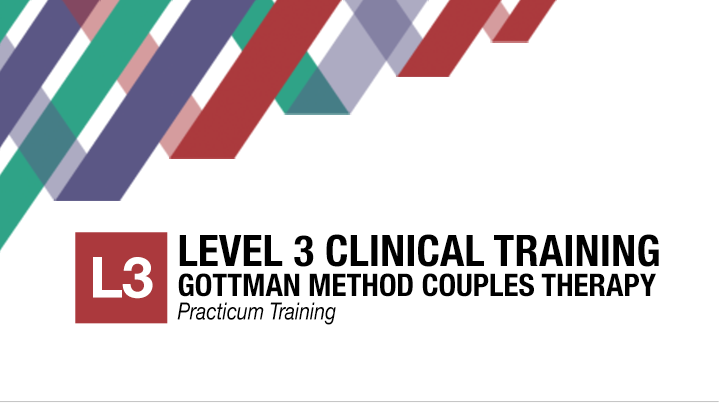 Through videotaped cases of real couples, hands-on role plays, demonstrations of assessments and interventions, and nuanced discussion of technique, the Level 3 Practicum significantly expands your understanding of when and how to use Gottman Method approaches. We cap attendance to provide a small-group setting where you will have the opportunity to practice and refine your use of Gottman Method therapy and receive personalized guidance in developing a roadmap for clinical decisions. 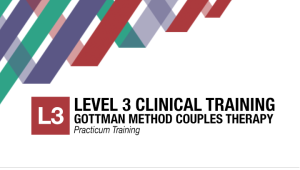 Level 3 Practicum content represents the true resistances and co-morbidities we face as therapists and how we can transform them into effective healing methods for the couple. Participants are asked to bring a short (ten minute or so) video segment of difficult and challenging couples to the Level 3 workshop. The therapist’s work with the couple will not be critiqued; in fact the video does not even need to show the therapist; just seeing the couple is all that is needed. The purpose will be to use these couples to illustrate how the Gottman Method can be applied to these tough cases. Participants will then have the opportunity to practice using these interventions in a supportive small group setting with other participants’ role playing the couples from the videos. Bringing a video tape isn’t required, but it will help make the training more meaningful for everyone. If you cannot bring a taped segment, it would help to bring a brief written description of a challenging couple for the same purpose. Who Should Attend This 3 Day Training? This workshop is appropriate for people who have master’s or doctoral degrees OR current enrollment in a graduate program within a mental health-related field who have completed Gottman Level 1 and Level 2 Live Training or DVD Home study. Therapy experience is highly recommended, but not required. Already attended Level 3 and want a refresher? If you attended Level 3 in the past and would like a refresher course, or if you are in Certification Track and want to “reset your clock”, you may attend our Level 3 for a minimal fee. Please contact Mary Beth George or Alysha Roll at 281.812-7529 for more information. Continuing Education: 20 CEUs for Texas LCSWs, LPCs and LMFTs. This event is co-sponsored by R. Cassidy Seminars. Psychologist and out of state licensees can register for CEU’s through the R. Cassidy Seminars after completion. Schedule: 8:30 a.m. – 5:00 p.m. each day. Registration starting at 8:00 a.m. on the first day. If you wish to divide your payment into two equal installments please contact our office at (281) 812-7529.